Presence of God – I recollect myself in the interior sanctuary of my soul to seek God there, living in me by grace. “The kingdom of God is within you” (Luke 17:21), Jesus taught us, and St. Teresa of Avila comments, “If a soul wishes to speak with its Father and enjoy His company, it does not have to go to heaven…. It needs no wings to go in search of Him but only to find a place where it can be alone and look upon Him present within itself” (Teresa of Jesus, Way of Perfection, 28). “It is to be observed that the Word, the Son of God, together with the Father and the Holy Spirit, is hidden, in essence and in presence, in the inmost being of the soul. Wherefore, the soul that would find Him must go forth from all things according to the affection and will, and enter within itself in deepest recollection so that all things are to it as though they were not…. God, then, is hidden within the soul and there the good contemplative must seek Him with love” (John of the Cross, Spiritual Canticle, 1,6). The answer is clear: God is within us but He is hidden. If we wish to find Him, we must go forth from all things, according to the affection and will. To “go forth,” according to the terminology of the Saint, signifies to detach oneself, deprive oneself, renounce oneself, annihilate oneself, to die spiritually to oneself and to all things. This is the path of the “nothing,” of complete detachment: it is the death of the old man, the indispensable condition for life in God. St. Paul, too, has said, “You are dead; and your life is hid with Christ in God” (Colossians 3:3). The loving search for God hidden within us goes hand in hand with this dying to the world and to ourselves. The more we die to ourselves, the more we find God. “O my God, make me understand that I am Your dwelling-place, the hiding place where You conceal Yourself. Have courage and rejoice, my soul, knowing that the object of your hope is so near to you that He dwells in you and you cannot exist without Him. What more could I desire, and what do I seek outside of myself, O my Lord and my God, when You have deigned to put Your kingdom, Your dwelling-place, in my very soul? Here, then, in the innermost sanctuary of my heart, I wish to love, desire, and adore You; no, I shall no longer go to seek You outside myself” (cf. John of the Cross, Spiritual Canticle 1,7.8). Exterior things, creatures and their discourse, may perhaps speak to me of You, but they are not You Yourself; therefore, they weary and distract me, whereas here, in the little heaven of my soul, I can find You as You really are, in Your whole essence, Your substance, Your charity. But I understand, O my God, that in order to find You, I must go forth from all things: go forth from the confusion and turbulence of the exterior life, from the noise of earthly things, from the curiosity which draws me outside to see, to hear, to know. I must go forth by my will, from all this exterior world which ever tries to attract my attention, thoughts, and affections. Help me to subdue my vain curiosity, my excessive loquacity; help me to pass through the vicissitudes of earthly life, its ostentatious attractions, its affairs, its whirling activity, without letting my eyes or my heart rest on these things, seeking for satisfaction, comfort and personal interest in them. To go forth from all things means to die—to die to the superficial life, to the purely human life, to the old man with all his passions. To go forth is to free oneself, to detach oneself from everything, to seek You alone. Does not this “going forth” call to mind that steep ascent of the mountain of perfection, that narrow path of the “nothing” which leads to the “all” of the life of perfect union with You? What a new light, O my God! How well I see that this ascent, this mountain of perfection, is the same magnificent summit on which the soul is perfectly united to You, and is found, not outside, but wholly within myself. The summit is Your secret hiding-place, and if I would find You, I must also hide myself with You, always walking in the way of the “nothing” of total detachment from all things. Will it be too much for me to detach myself from everything, to leave all things in order to find You, O my God? It is a comfort to my weakness to know that I am not alone on this rough road of complete renouncement—You are always with me. O Father, be my strength; O Word, be my light; O Holy Spirit, be my love! O Most Holy Trinity, be my great treasure, for to find You, it is very little to sell all the things of this earth! Note from Dan: This post “In Search of God” is provided courtesy of Baronius Press and contains one of two meditations for the day. If you would like to get the full meditation from one of the best daily meditation works ever compiled, you can learn more here: Divine Intimacy. Please honor those who support us by purchasing and promoting their products. 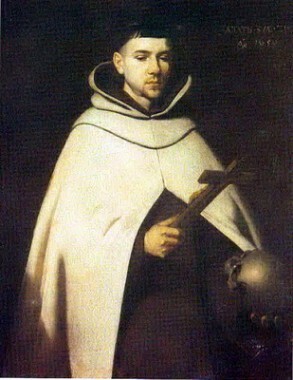 Art for this post “In Search of God”: St. John of the Cross, Francisco de Zurbarán, 1656, PD-US, Wikimedia Commons. Father Gabriel of St. Mary Magdalen, mirror from open source material.